While at Rainforest Writers Village, Devon Monk gave a great talk about writing faster. She talked about how writing faster is an uncomfortable act and thus it can be really helpful to maximise the comfort around you while you dive in. Have your creature comforts around you so that you can focus your energy on the hard work that needs to happen. 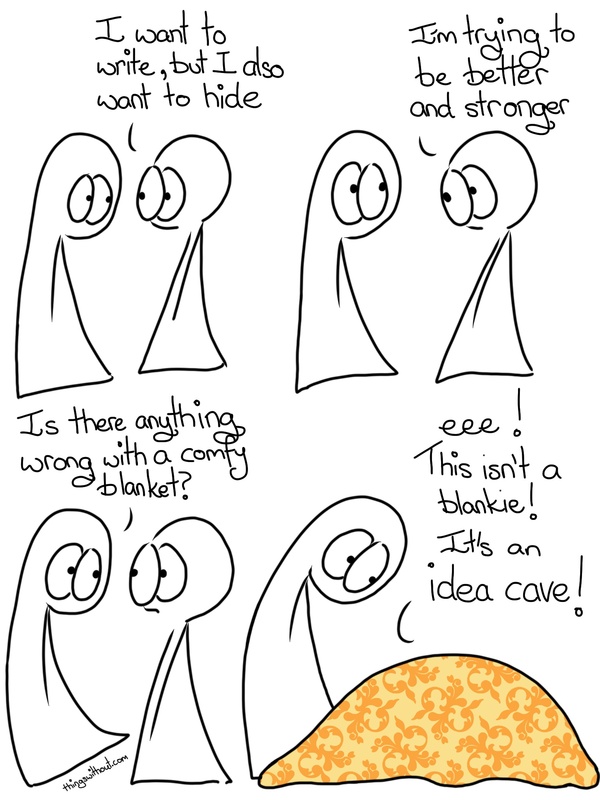 Her talk reminded me of the blankie comics I’ve drawn. All the blankie comics have been drawn while under actual blanket covers, sometimes falling asleep several times in the process. I drew this comic shortly after the retreat. I’d had a busy and productive morning writing, but I also wanted to draw. I sat on my couch and had no ideas until I grabbed a blankie and got under it. This comic sprang forth almost immediately.